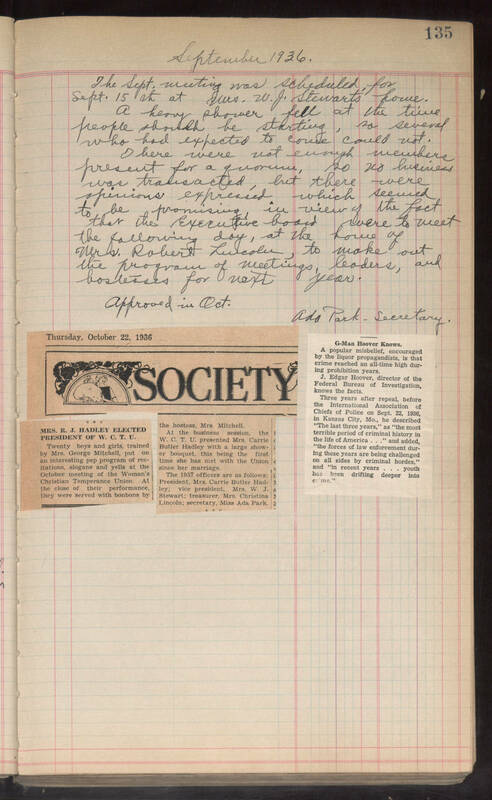 135 September 1936 The Sept. meeting was scheduled for Sept. 15th at Trs.[?]. W. J. Stewart's house. A heavy shower fell at the time people should be starting, so several who had expected to come could not. There were not enough members present for a quorum, so no business was transacted, but there were opinions expressed which seemed to be promising in view of the fact that the Executive board were to meet the following day, at the house of Mrs. Robert Lincoln, to make out the programs of meetings, leaders, and hostesses for next year. Ada Park-Secretary. approved in Oct. Three newspaper clippings attached to the bottom of the page.